As I pointed out there, these days teens value the written word. That’s big. It means that when it comes to teens and writing, parents–homeschooling and otherwise–and teachers have a hook. Traditional school writing, such as the rickety, follow-the-formula research paper, doesn’t have that motivating audience. Who’s the audience when it comes to school writing? Usually, a single teacher. For the purpose of a grade. So, how can you make kids’ “academic” writing as engaging as the writing they do on their own? You start with the formats kids are already using. I’ve been reading The Digital Writing Workshop by Troy Hicks. In this book, Hicks offers chapter after chapter of possibilities for using digital media with kids’ writing. He shows how to set kids up with RSS feeds to follow topics of personal interest, how to help them use social bookmarking to keep track of information they want to remember, how to start them writing blogs, wikis and cooperatively-written texts. It’s a book written for classroom teachers, but I imagine it could be useful as well to a homeschooling parent, or a parent who wants to help a child find more writing options than he or she is being offered in school. Need a more concrete example? Here’s a wiki written by Hicks, intended to be used by groups of kids when exploring a new nonfiction topic. 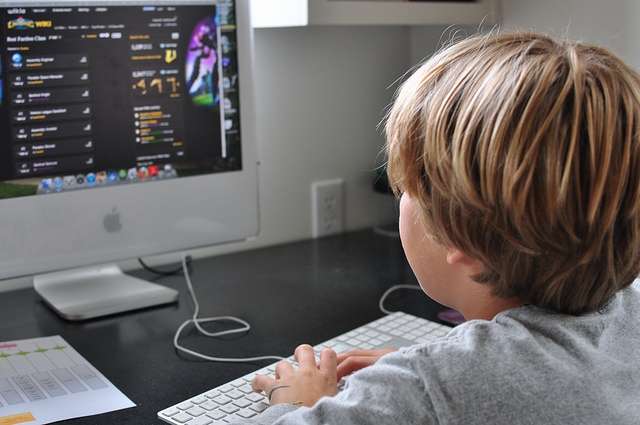 As you can see, kids are linked to tools to help them create websites, infographics, instructional videos, timelines, maps and a bibliography using social bookmarking services. A homeschooling family might use this wiki differently. They might start with a child’s existing interest, and then parent and child could explore some of these links together in search of a format that the child finds compelling. Mr. T and I did this last week. He’s been curious about the various species in the cat family and thought it might be fun to make some sort of chart on the topic. We looked at the infographic links and found a service for him to use. I helped him get started on the chart; eventually he was able to complete it on his own. We’re talking about the possibility of him starting a (password-protected) blog, so he can share future graphs and other projects with friends and family. In my workshops for homeschooling parents, I encourage them (repeatedly!) to start with their children’s interests, and to consider the writing opportunities suggested by those interests. For instance, when H was a young teen and interested in Christopher Paolini’s Inheritance series, he applied for and received a volunteer position writing for Shurtagal.com, the fansite for the series. H helped write an early wiki of terms and characters from the book. This was something he did almost entirely independent of me. Was it valuable writing instruction? Absolutely. Likewise, starting at age eleven, Lulu held a volunteer position writing for the New Moon Magazine website, New Moon Girls. Her position involved not only writing content, but also “attending” online planning meetings conducted entirely via written chat. This was something that Lulu was highly motivated to do; it was also incredibly helpful in her development as a writer. My role in both of these instances was simply to recognize that my kids were intrigued by these forums, and to encourage them to try to get involved. I helped both with their applications; they took over from there. Does your child write in an online format? What? Where? Please leave a comment! Let’s chat about all the possibilities out there for kids. Digital writing has so much potential–for kids to write independently, for kids to work in small groups. There’s just too much to cover in one post. Consider this a teaser. I hope to do some big bellyflops into specific digital topics here in the future. If these tech-savvy students didn’t learn their tech skills in school, where did they learn them? Most likely, they taught themselves. Likewise, many students will teach themselves how to write well, through the digital forums in which they participate. But wouldn’t it be nice if those same kids could take their enthusiasm for writing, and apply it to their coursework? If more teachers were like Troy Hicks, using kids’ interests and media that’s relevant to them as guiding principals of instruction? Homeschoolers and other parents, you don’t have to wait for schools to come around. You can nurture this sort of writing education right now. Pay attention to your kids’ interests and open your mind to the writing possibilities. And then try to encourage. Ever so gently. Very relevant and useful ideas and thoughts, Patricia. I totally agree with you – the writing format and media used in school is hardly exciting for children. On the contrary, it boxes their thinking – as you said – in the five paragraph format. My 5.5 year old daughter is very tech savvy already. While she loves writing using the traditional tools – text book and a pencil/pen (for her, the ‘text book’ has to be a diary! ), she loves writing using the digital media. This was the reason I set up an email account for her about 6 months back because I knew she would love exchanging notes about her day to day life/art/craft/reading with me and other family members. I also have her use couple of online story-writing tools. She uses the pre-provided pics or I upload our pics that she can use to storyboard and write short stories. Besides, I started doing something else recently – on my blog – which is also a lot about her art/creativity etc. I have her reply to some of the emails where readers complimented her art work etc. I think it’s fair that she writes a thank you note or anything related to the reader. It also gives her a sense of pride and ownership. Fantastic, Rashmie! I love how you’re providing your daughter with real-world writing opportunities. That’s what motivates kids to keep writing–and your daughter is figuring that out at five-and-a-half! How great that she’s responding to comments about herself on your blog! That’s really neat. Found you from your twitter follow. Love your how we homeschool post. Couldn’t comment there so doing it here (smile). Hi Renee! So honored to have you stop by! I love your blog and your insight. I just haven’t been getting around and reading and commenting in the last six weeks or so, but I’m sure I will once fall settles in. I appreciated your tweet today about creating vs. consuming today. I can relate! Patricia, this is interesting…I remember, when I lived at my in-laws for a while, that Mali (then 14) had a blog that was part of her homeschooling curriculum. It had a very specific focus (not her idea) and often was about things she didn’t particularly have an interest in. It was more like a research paper every week and not at all a creative pursuit. She HATED writing it. She hated even thinking about writing it. I asked her what she would write about if she had a personal blog and, as I knew she would reply, she said it would be focused on food and cooking, a passion of hers. So, while she was visiting us in VT this summer, I helped her create a blog page that was just for her, totally independent of her homeschooling activities and it is wonderful to see how excited she is about creating a new post and how the ideas for the next one come faster than she can get down the one she’s already working on. I play the role of editor, so I can help her along with her writing, but I try to keep my suggestions mellow so it doesn’t feel too…”educational.” ha ha. I’m just glad she is finally getting excited about expressing herself with the art of writing. What a great story, Shannon. It really demonstrates the power of internal motivation when it comes to writing! How great that you recognized that Mali might enjoy blogging if the content were about something she cared about. And kudos for recognizing that editing “gently” can instruct while still allowing the writer to own the work. Thanks so much for sharing this. I’m excited for Mali too! Patricia, wow, I’m overwhelmed with so much evidence and information. And you know what? The other day my Harry Potter-obsessed son asked me to write his Dictionary/Encyclopedia of magic phrases (enchantments? sorry, don’t know the exact word) from the Harry Potter series on the computer and then to have it printed so he could make a book. And what did I do? I said no, because he was already writing it by hand and he has to improve his handwriting and his spelling. (Yeah, mean Mom). But he did not give up his project, he’s still handwriting it all and trying to figure out by himself what should the Latin mean (Portuguese is a Latin-derived language). Very interesting. I think I’ll let him copy it all on the computer and print it in the end, though. Wait–isn’t that Harry Potter-obsessed son the one who “doesn’t like to write”? How exciting that days later he is still working at his project! Again, more evidence for the power of interest-driven projects and internal motivation. One idea you might want to consider would be typing his project into the computer for him while he reads his work to you. I suggest this because I’ve discovered (quite by accident) that this can be a great way to naturally encourage kids to revise their work. I find that kids tend to dislike revising–but if someone else is doing the recording and they’re just reading their work, they often finesse it as they dictate, simply because it’s so easy to do that orally. I wouldn’t require a child to revise in this way, or mention revision at all; I’d simply try taking the dictation and seeing if the child chooses to make changes to the piece. Excellent! I love your ideas here and totally agree. Actually, I’ve thought about this a lot and I suspect that teachers who don’t see themselves as writers fear releasing young writers into the unknown world of discovery and wonder. Sigh. Or maybe that’s not it. What do you think? I imagine that’s part of it. But I’m guessing, too, that the climate of testing and accountability that our public schools are mired in is not allowing for the professional development that teachers need to pursue innovative ideas in writing. Since writing isn’t even a skill tested on the federal No Child Left Behind tests, it’s often being neglected these days for instruction in reading and math, which are tested. The Troy Hicks book I mentioned above is fantastic, and I know the ideas he promotes are being used in many classrooms. I just wish they were used in all classrooms–but I’m afraid that day won’t come until the pendulum swings towards kids’ needs and away from accountability-via-testing. Nice to hear from you, Melissa! This isn’t quite the same, but my son surprised me by wanting to write haiku about the Lego Universe online video game (which he doesn’t even play yet, but still knows a lot about). It was for a contest that could win him Lego sets. To submit, he posted three haiku on a message board on the Lego website. Oh, that is what I’m talking about, Carrie. It’s using real-world writing based on personal interests. Mr. T actually has started playing Lego Universe (he bought himself a month-long membership) and it’s also inspired some writing from him, which I’ll be writing about in my next post!